Building and contracting your own house is undoubtedly a rewarding experience, but it can be overwhelming as well. 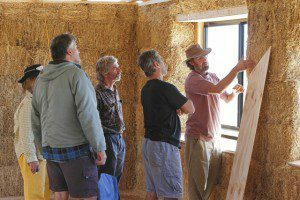 There are so many details to keep track of and many of those details are specific to straw bale construction so even a seasoned architect or contractor used to working on conventional homes may not be able to properly direct you in the process. Tackling the project alone may feel like too much for you. After all, we all need help from time to time, and building a house is certainly one of those times. I have worked with hundreds of people over the years and I have helped them all achieve their dream of building their own straw bale house. I can help you too. Below are three of my most popular consulting packages. I believe these options offer you the best chances of success with your build. Perhaps you need some help making sure your plans are in order and are set up for the easiest and highest quality construction of your home. Maybe you want help training a crew to do the baling, plaster prep, or even the plastering itself. Or perhaps you plan to do the majority of the building and contracting yourself but you want security, comfort and access to an expert for the duration of the project. 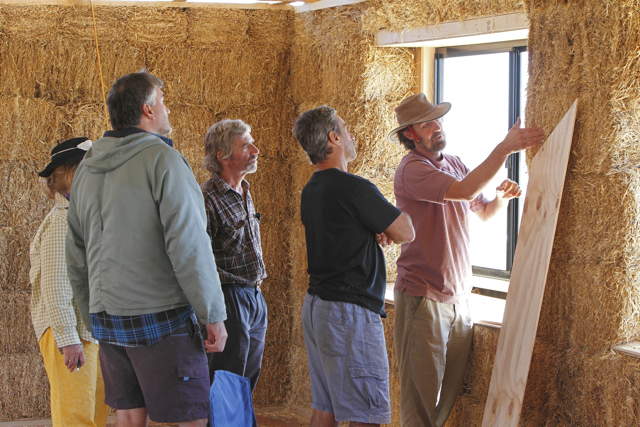 If you plan on building a straw bale house, either by yourself or with a contractor unfamiliar with straw bale construction, I believe you will find a package here to help you achieve the success you are after without the stress that so often accompanies construction projects. Spots are limited in each consulting package and spots will be given on a first come, first served basis. A full review of construction drawings allows us to catch mistakes before they happen in the field. A plan review is a great investment in the success of your project. Even if you’ve hired a professional to design your plans for you, if they don’t have a lot of experience with straw bale, it is not uncommon for the plans to be riddled with redundant, archaic, or time wasting construction techniques. Catching issues in the plans BEFORE you start building will save you significant amounts of money and time. 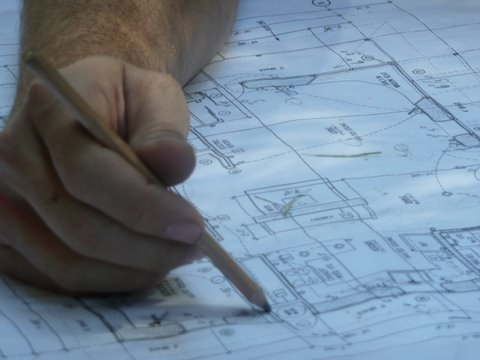 Furthermore, once plans are approved, the building department can require you to build the structure “as drawn” so even if you catch the mistakes, it may be too late to make changes. • Ensure that the construction techniques suggested in the plans are the most efficient and yield the best results. • Get faster (and easier!) approval of your straw bale plans from your building department when your plans are clear of mistakes. • Show your contractor (if using one), bank, and building officials that you have a viable building project with a strong set of designs. • Get better estimates on your project with a complete and error free set of plans. • I will do a thorough window and door details evaluation on each set of plans, the area that is typically riddled with errors and which causes the most problems down the road. • Where applicable, I will make design suggestions to save on building costs by doing a thorough floor plan evaluation. • All changes and suggestions will be detailed in a thorough report. If you plan on contracting out the baling portion of the build to someone that doesn’t have a lot of experience with baling, consider a crew training. The techniques I teach are based on building well over 60 straw bale houses and through those experiences, I have streamlined the process and have come up with new techniques to increase job efficiency. The money that you will save by educating your baling crew with these time saving techniques will more than pay for the Crew Training Consulting Package. Another scenario in which the Crew Training is beneficial is if you plan to bale the structure yourself with the help of friends and family but aren’t confident about how to actually do it. Using the same approach as if training a professional crew, I can teach your group how to bale with confidence and efficiency. It’s like having your very own private workshop with just your friends and family. In Crew Trainings, I work with your crew or crew leaders for three full (3) days to get them fully prepared for the work ahead. I teach them, hands-­on, how to bale from start to finish and how to complete the preparations for plaster. In some cases, we can actually apply the first coat of plaster as well. We work on one wall section and prepare it fully so that each member of the crew has first hand experience of how the systems work. I also include one (1) month of consulting in this package including access to me via email, Skype and phone. I respond to emails and phone calls within 24 hours, Monday-Friday (except during holidays or if out of phone/internet range). A faster response time is possible if an emergency is noted. Skype calls are scheduled in advance. My travel and lodging expenses are not included in this package price and are paid by the client. This is the perfect option if you want support throughout your entire project. I can help with all aspects of the job from design, to permit approval, to final plaster having been a contractor for over 15 years. The package includes access to me via email, Skype and phone for one full year. I respond to emails and phone calls within 24 hours, Monday-Friday (except during holidays or if out of phone/internet range). A faster response time is possible if an emergency is noted. Skype calls are scheduled in advance. This package also includes the Construction Drawing Review and Crew Training packages. My travel and lodging expenses are not included in this package price and are paid by the client. Supplementary site visits can be arranged for an additional fee. Should outside design and/or engineering adjustments need to be made, said “extra” costs are forwarded to the client. The client shall approve of all “extra” costs prior to executing the suggested work. • One Full Year of Consulting and access to me with any questions that arise from design issues, getting plans through the building department, and acquiring insurance to foundation, framing, baling, plastering, and interior finish work questions. I wish I had brought Andrew on earlier in the process. Once he got on board, things smoothed out tremendously. The help I got from Andrew was great. What started as a simple plan review ended up saving me thousands of dollars in the long run. The number of mistakes on my plans was crazy, even though I had an architect do the drawings. 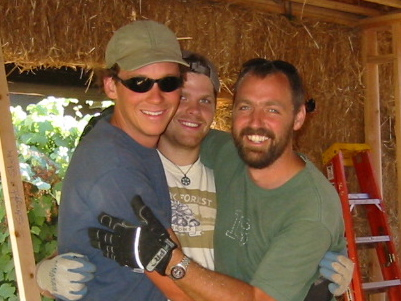 I worked with Andrew during the construction of my home. I acted as my own contractor. The support I received from him was priceless. His technical knowledge of straw bale construction was why I decided to work with him, but I really feel like the personal support he offered me throughout the process was what helped me succeed in building my own house.